Few things make me happier than a table full of sides and salads and my fridge is always filled with bowls of colour that I dive in and out of all week. This is one of my latest favourites, it’s good hot or cold and the flavour holds for days. 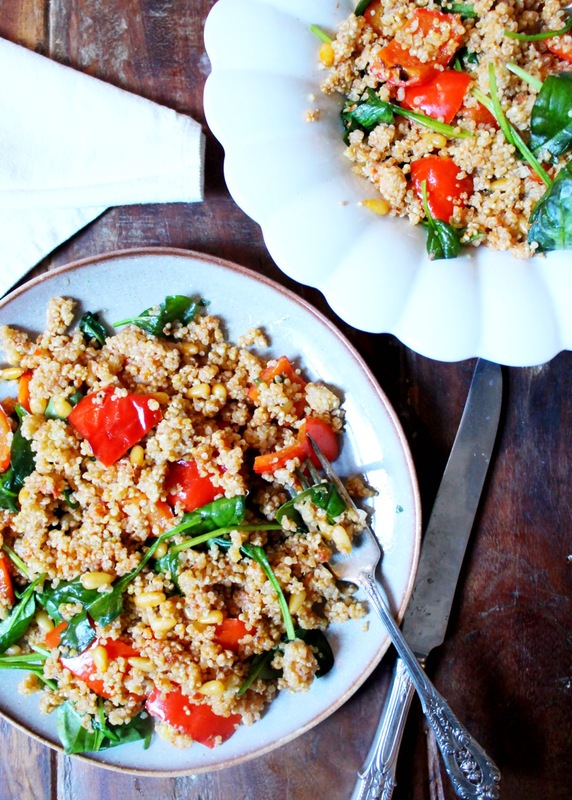 The peppers are roasted in balsamic and olive oil before being tossed in garlic, pine nuts and sundried tomato paste and then tumbled through quinoa and spinach. And it tastes as good as it sounds! Chop the peppers into squares and add them to a roasting tray. Drizzle on a tablespoon of balsamic vinegar and a tablespoon of olive oil. Add a sprinkle of salt and pepper and toss. Roast at 200’C for about 20 minutes. While the peppers are in the oven, make the quinoa. Add the quinoa and stock to a pot on medium heat and pop the lid on. Cook for 13-15 minutes until all the visible water has been absorbed, then remove from the heat, fluff it with a fork and pop the lid back on. Add another tablespoon of olive oil to a large pan on medium heat. Mince the garlic and add it to the pan with the pine nuts. Cook for a few minutes until the garlic has started to soften and the pine nuts are golden. Turn the heat down a little and add in the sundried tomato paste and roasted peppers. Toss everything well. Add in the cooked quinoa and the spinach and toss until everything is mixed together well and the spinach is lightly wilted. 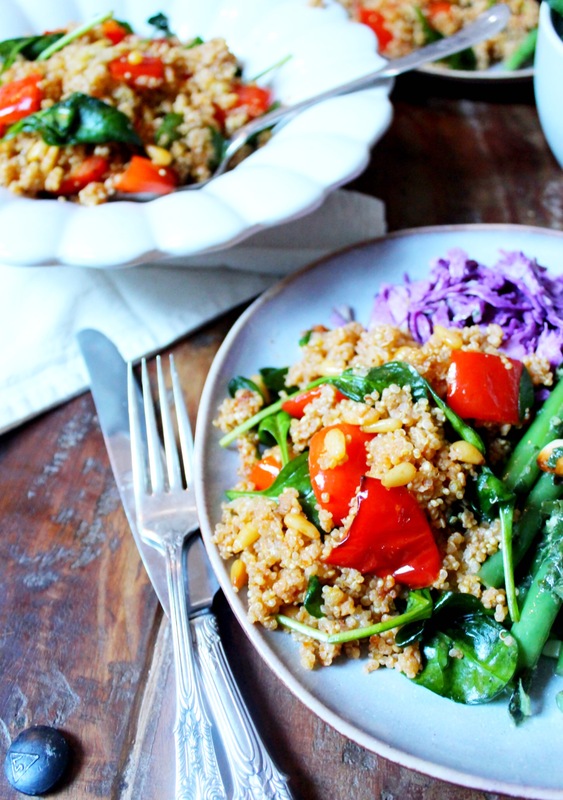 Quinoa and roasted veggies is one of my favourite combinations. I need to make that this week! This is a wonderful recipe. It is really tasty and refreshing, even more so when it’s cold and straight out of the refrigerator. Great as an impromptu snack or a meal in very hot weather. I used half quinoa and half brown rice and sundried tomato balsamic vinegar.